Sales success requires more than talent, and more than skill. In sales, the intangibles matter: Perseverance. Self-discipline. Mental toughness. Ask any decorated long-term sales professional, and you’ll hear those characteristics described as being vital components to their success. During those periods, internal motivation is your only lifeline. The following five video clips are here to help. For sales professionals, sources of external motivation are always in high demand. As with Ambition’s original post, each of these clips were chosen for their resonance to sales professionals. Here they are. For nearly 25 years, Will Smith has been one of the most charismatic, likable actors in the world. He’s the quintessential “leading man,” in that he seems preternaturally amiable, cool and comfortable in his own skin. Younger sales reps may look at veteran top performers and wonder, “How does he/she make it look so easy?” The answer is repetition, dedication, and years of honing one’s craft and putting in long man hours to master it. Millennial reps, raised in an era of instant gratification, may be more prone to frustration from early setbacks than others. To them, I remind you, it takes time. If you work hard enough, it won’t take as long as you think. Will Smith nails it here: Start putting the hours in early and often, outwork everyone around you, and soon enough, you’ll be making success look easy. It’s true of any profession, and damn sure true in sales. Let this video act as a helpful reminder that, on a macro-level, doing the same thing over and over and expecting a different result can apply in sales. Your 10,000th cold call is going to sound nothing like your 10th cold call. Getting to that 10,000th cold call is what gives you the opportunity to reach the level of Will Smith — where success is strictly a matter of muscle memory. There’s a very strong chance you’re already familiar with this video. If that’s the case, good for you. In 10 years, it’s due to surpass the Glenglarry Glen Ross speech as the Holy Grail of fictional sales monologue. 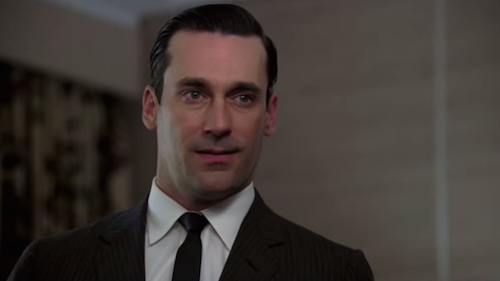 If you’re in sales or marketing, and you haven’t watched Mad Men, you’re missing out on the most thought-provoking TV series there is for you, as a professional. There’s a tendency for those of us in these fields to always focus on the logical. To sell our products based on cold, hard data, return-on-investment, competitive pricing, and so forth. Many sales reps are conscious about making an emotional connection with their prospects. However, the best are just as conscious about creating an emotional connection between the prospect and the product, commodity or service they are selling. In the case of the Kodak Carousel here, the nerve Don touches upon is a profound one: The sense of family. Does your product or service make someone’s life easier or simplify an arduous process? Get your prospect thinking about it in terms of luxury, or innovation, or empowerment. Whatever matters most to them, based on your conversations. That’s the Don Draper way, and it’s one we should all live by. Never forget it. Forget Ray Lewis’ checkered past and ask yourself one question: Are you pissed off for greatness? If not, why aren’t you? What are you afraid of? It’s okay for some professionals to go without being pissed off for greatness, but not for you. Every day you spend apathetic at work is literally costing you. You’re in sales. You’re a competitor. You need to feel the words of Ray Lewis in your bones. Another great facet of Lewis’s speech: Talking about success in terms of team. Aside from the tangible, individual objectives you face, the best way for you to get ahead in your profession is to exude the intangible qualities of a team leader. It doesn’t matter how many deals you close. You will never reach the highest levels of your profession, nor enjoy the fruits of your efforts to their maximum extent, if you aren’t also bringing intangible, team-oriented benefits to your team. Professional reincarnation, as a sales industry member, is something you should strive to experience every morning after a rough day, and every moment after a crushing disappointment. It’s not pseudo-spiritual mumbo jumbo; it’s your best defense mechanism against disillusionment and apathy. Much of your job hinges on things beyond your control. Focus on cultivating a strong mentality — the ingredient to your success and the main thing you will always have complete control over throughout your career. A twisted aspect of the sales professional — it’s not uncommon for you to experience failure before you’ve even finished your first cup of coffee…on a daily basis. The more you embrace failure, the more rapidly you’ll experience sustained success in your profession. That enlightenment? Realizing that the ultimate fear is lying on your death bed, surrounded by “the ghosts of your untapped potential.” Then using that fear to propel you past whatever less significant fear is holding you back at this very moment. Listen to Denzel, sales professionals of the world. The final video on this list isn’t an inspiring speech. There’s no moment of enlightenment. No intellectual brilliance on display. No rousing “pump up” speeches. Because for all of their great qualities, rousing speeches end, inspiration fades, and what awaits on the other end is hours and hours of repetitive, challenging hard work. The U.S. Army’s “Hard Work” cadence is what I listen to on occasions where I’m entering the 12th consecutive hour at the office. The cadence is relentless in its repetition. Unwavering in its conviction. Defiant in its attitude towards the subject matter at hand. Those qualities are the reflection of the consummate sales professional. There’s an old saying, “Consistency is the essence of greatness.” And in terms of motivational YouTube clips, they don’t come any more consistent than this video. Embrace its message and strive to be its physical embodiment. This concludes our list of epic videos to motivate your salesforce. To see the first edition, click here. Learn more sales tips with the free ebook below.